Ready to open your virtual store online? Omega's eCommerce solution, theShoppingCart.com, has all the capabilities you'll need to develop and market a successful online storefront. Omega will provide you with a powerful, reliable, user-friendly eCommerce site to drive your business on the World Wide Web. The Shopping Cart is a turnkey solution for promoting and managing your product sales. Use our application as a standalone e-Commerce website, provide your sales reps with an easy-to-use online ordering and customer management console or manage your entire business by combining retail store and Internet sales through our complete Point-of-Sale solution ... all while managing customers and product inventory through the same web-based database and administrative console. View benefits and features of theShoppingCart.com. Omega understands supply chain management and has a long history of developing low cost-of-ownership solutions. The features of our system are the direct result of listening to our clients then implementing their ideas. We believe in "Thinking no Boundaries" and have provided solutions Worldwide from Mom and Pop operations to Fortune 100 companies. theShoppingCart.com will provide you with: More information is here. - One management platform to control Web ordering, Customer Care and Point-of-Sale. - Improve the flow of data integration. - Control inventory, cash flow and customer relationships. - Purchase to Delivery data management and reporting. - Deliver rapid deployment and unlimited scalability across diverse locations. Omega is proud to be one of the first e-Commerce platforms that automatically detected mobile device technology (such as the Apple iPhone®) and formatted itself to fit any device. Our system is completely mobile ready e-Commerce. 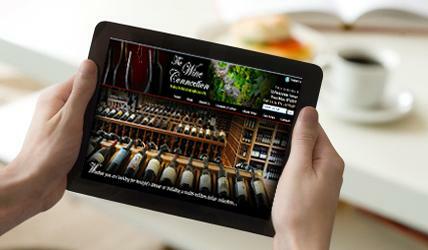 One of our customers, The Wine Connection, was one of the first retail outlets in New England to fully embrace Apple Technology and their case study (along with Omega's solution) is highlighted on the Apple's iPhone® small business solution website. Omega's technology combines your Website, Customer Care, Mail Order and your retail Point-of-Sale functions into one robust e-Commerce solution. View the case study here. Omega Communications, Inc. (dba Omega Solutions) is celebrating it's 30th year anniversary this year and has been delivering custom Web and e-Commerce solutions to its clients since 1996. Celebrating nearly 30 years of success, Omega is a proven pioneer in the ever-changing digital landscape. Omega is driven by it's expertise in providing customized and market-focused based solutions that best utilize the data our client's collect and own. Omega's relationship with the UPS Supply Chain Solutions® Group allows us to deliver and maintain custom digital solutions for some of its premier corporate clients. Omega is proud to be one of the select e-Commerce solutions to fully and seamlessly integrate with UPSs Global Warehouse Management System. We are also one of eleven authorized UPS OnLine® tools integrator. View the list here. Please contact us to schedule a complimentary initial consultation. And we'll make it easy. Just click this link and your e-mail program will open with e-mail of the person you need to talk already filled out. If you prefer to talk to us, please call us at 860-276-8504 and ask for Charlie. Omega can help you Develop the right solution to fit your business. You do not have to fit your business to the solution.